In her dazzling new book, Jennifer Elise Foerster announces a frightening new truth: "the continent is dismantling." 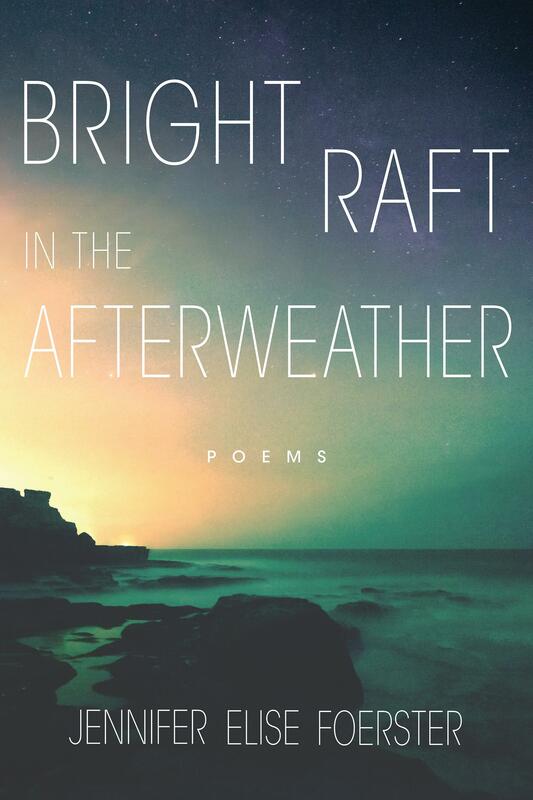 Bright Raft in the Afterweather travels the spheres of the past, present, future, and eternal time, exploring the fault lines that signal the break of humanity's consciousness from the earth. Featuring recurring characters, settings, and motifs from her previous book, Leaving Tulsa, Foerster takes the reader on a solitary journey to the edges of the continents of mind and time to discover what makes us human. Along the way, the author surveys the intersection between natural landscapes and the urban world, baring parallels to the conflicts between Native American peoples and Western colonizers, and considering how imagination and representation can both destroy and remake our worlds. Foerster's captivating language and evocative imagery immerse the reader in a narrative of disorientation and reintegration. Each poem blends Foerster's refined use of language with a mythic and environmental lyricism as she explores themes of destruction, spirituality, loss, and remembrance. In a world wrought with ecological imbalance and grief, Foerster shows how from the devastated land of our alienation there is potential to reconnect to our origins and redefine the terms by which we inhabit humanity and the earth. Foerster's journey transcends both geographic space and the confines of the page to live vividly in the mind of the reader. "We are adrift in mythic waters that hold the possibility of rebirth even as they float the remains of human destruction. We could be in San Francisco, within the mythos of a painter's creation, or walking a Greek island with time. Wherever we are in the poems, islands rise up of tremendous linguistic beauty, rendering hope from songs. The book is a bird flown free in the power of the winds." "Pick this book's dark pages—befriend it—and you'll come to know Jennifer Foerster's second collection as a particularly strong chronicle of ontological strain. It's everywhere at once and also singular, very like the world it finds itself in and about. And what it enables its fortunate readers to access is not the satisfaction of so-called closure, but rather the rush and the precariousness of connection, the act, as Wallace Stevens says, 'of finding / What will suffice.'" "Here is a language that adjusts to—is touched and changed by—the details and registers of its worlds. I think of the dilating eye, the body interpreting light, and so, scene by scene and sense by sense, becoming. In particular, Jennifer Elise Foerster's precise and gorgeously strange, original diction is a site or result of this unending shifting. This empathic, lucid work flickers with the knowledge that under this word (place) is another word (place), evoking wonder and gratitude. '[W]alk into the greenly singular, singing / the long sight line,' she writes, and makes me remember that to read poetry is to read more than language; it is to read a body, a place, a world." "Merging the poetic with the prophetic, Foerster offers a startling vision of how to navigate this broken world and its resilient beauty." In her first magical collection of poetry, Jennifer Elise Foerster weaves together a mythic and geographic exploration of a woman's coming of age in a dislocated time. Leaving Tulsa, a book of road elegies and laments, travels from Oklahoma to the edges of the American continent through landscapes at once stark and lush, ancient and apocalyptic. The imagery that cycles through the poems—fire, shell, highway, wing—gives the collection a rich lyrical-dramatic texture. Each poem builds on a theme of searching for a lost "self"—an "other" America—that crosses biblical, tribal, and ecological mythologies. 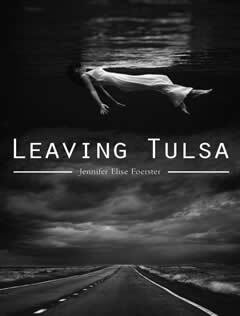 In Leaving Tulsa, Foerster is not afraid of the strange or of estrangement. The narrator occupies a space in between and navigates the offbeat experiences of a speaker that is of both Muscogee and European heritage. With bold images and candid language, Foerster challenges the perceptions of what it means to be Native, what it means to be a woman, and what it means to be an American today. Ultimately, these brave and luminous poems engage and shatter the boundaries of time, self, and continent. Book Review by Tess Taylor, NPR "All Things Considered"
"Foerster is that rarity in our time of fragmentation and apocalypse: a poet who explores history and pain, yes, but a poet, also, of healing and hope. Leaving Tulsa is heartening and beautiful and necessary." "In these poems spun from what has been scattered, Jennifer Foerster fashions the vessels not to re-gather those 'relics/littering the plains,' but to honor, to name. She herself has learned, beautifully." "Foerster has her own voice and an ability to shift that voice to show past, present, mythic time, dream landscape and a myriad of other states of mind. Themes of cultural recovery, in particular among Muskoge/Creek, and negotiation of female experience carry throughout the collection. The poems are lyrical and intense." "An atlas / on the underside of my dream," writes Jennifer Elise Foerster. In these sharp, visceral poems, she journeys through the American landscape and maps what has burned and vanished and yet persists. This is a book of endings and beginnings, of immediate memory and urgent, lyrical insight." "In her poetry, Foerster defines the indefinable, and makes the indefinable, the invisible, present. It is that place, between the worlds, so to speak, this in-betweeness, where words spoken have much to say and the words unspoken are left for a reader to fill. Poetry per excellence, then, poetry that has beauty, power of images and emotions, poetry that invites you to take a journey into the unknown…"
"Wow. This first book of poems by Jennifer Foerster reminds me of the urgent vision fueling Kerouac's On the Road. The road is a demanding being. Foerster spins her poem-songs like wheels. She's from a younger generation, and not a man but a young native woman trying to put the story of a broken people back together." © 2015 Jennifer Foerster. All rights reserved.